Well I think I can safely say that this mornings race was one of the funnest races I have done in a long time. 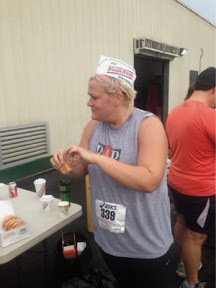 So the challenge goes like this....you run 2 miles to Krispy Kreme Donuts, eat a dozen donuts, and then run 2 miles back to the finish. You can run it as an individual or as a team but not me, I met several guys from my CrossFit class and we all did it as individuals. Who wants to eat some donuts?!?!?!!? 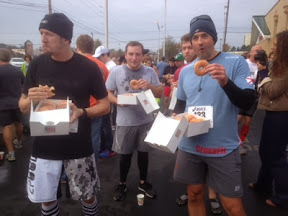 The race started at 8am which was quite nice because I skipped breakfast in anticipation for all the donuts. Good decision right!? 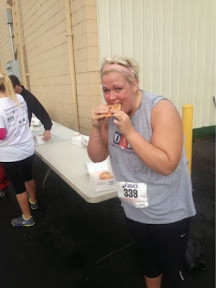 We were off and I had decided that I was going to try to go out faster than I would normally because i needed to do the first 2 miles in 20 minutes to allow myself time to eat the donuts and hobble back. The bad part of that plan was that I didn't look at a clock not once. 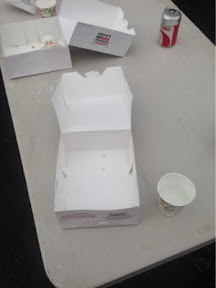 As I ran into the parking lot there were lots of people sitting, standing and cramming donuts into their mouths. Luckily I was greeted by friends, Ralph and Jen (hello thanks so much for coming and holding all my crap while I ate), and all the guys that I was running the race with. and smashing them together and eating them 3 at a time. It was so cool cause I had people to talk to while I ate them. I know its an amazing thing to say but I got down the first 6 ok, the next 3 went a lot slower and the last 3 were almost comically slow. 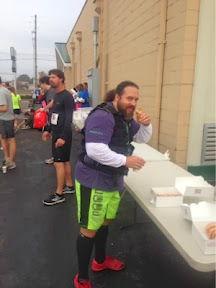 This is Alex, he is my CrossFit coach and he ate 12 donuts in about 2 minutes. I have never seen anything quite like it!!! He destroyed that dozen. AND I FINALLY DID IT, I GOT THEM ALL DOWN! This was a proud moment in my life! Who would have thunk it....a girl I went to high school with the sticker hander outer! I was so excited about this sticker that I requested 2. 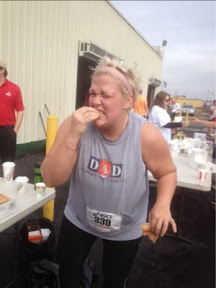 I didn't see anyone puke but I know it was happening around me....this girl was the funniest I saw all day long. I would watch her put a donut in her mouth and then start crying and jumping and whining. I watched her as long as I could but I was afraid she was going to lose it so I finally turned the other way. Once it was time to start running again I realized that I had to get my last 2 miles done in 14 minutes. 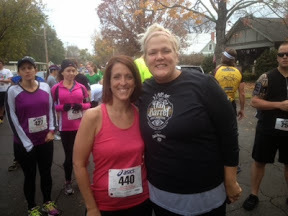 By the way, I don't run 7 minute miles! 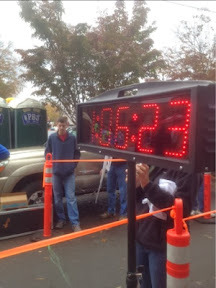 I just knew I had to go, as fast as I could to make the 1 hour time mark. I was amazed at the run back. I was not hurting like I thought I would be. I think it was all the excitement. 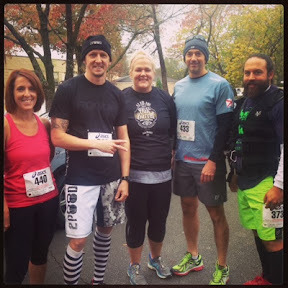 As I came up towards the finish line I could hear the crowd and saw some friendly faces to run in with me. All the boys had come back and ran the last 50 yards or so with me. 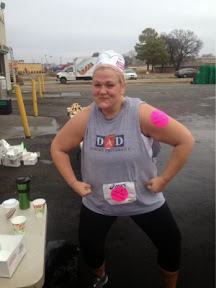 I didn't quite make the 1 hour mark but 1:06 for 4 miles and 12 donuts was a pretty good time for me. And they gave me the shirt so it was all worth it. 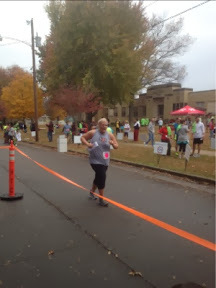 I finished up this race with the biggest smile on my face. 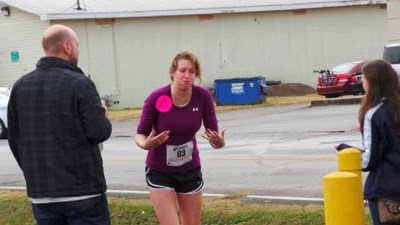 It was almost like finishing my first race. I was so happy that I did it and didn't puke!!!! 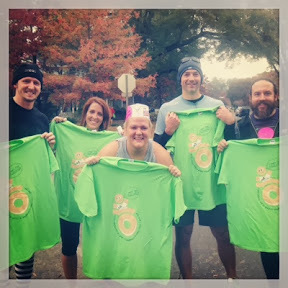 And I had a new shirt, Krispy Kreme hat and and belly ache so it was all worth it! 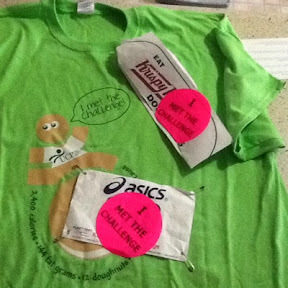 This is officially one of my favorite race bibs to date. 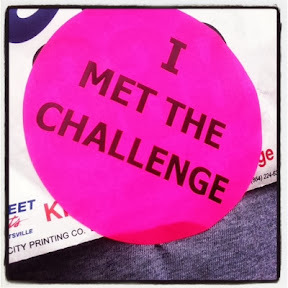 This is a must do and needs to be on every runners bucket list. 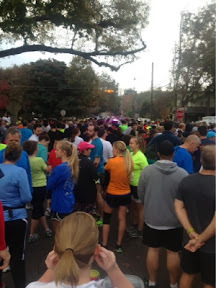 I am so happy that I did it and think this might become a yearly run for me. No guilt over the calories, Ill just take this as my free day....totally worth it!